Even the most progressive proponents of climate change mitigation frame their argument with the proposition that the “cost” of mitigation today is far less than what the “cost” of climate change will be down the road if we fail to act now. While it sounds compelling, this argument perpetrates a deep confusion about what “cost” means when applied to the idea of inventing, designing and building the carbon-neutral infrastructure and energy systems that climate mitigation will require. This confusion, in turn, makes it more difficult for the political process to make rational decisions. To illustrate, we need look no further than the recent United Nations IPCC report which, for the first time, not only details the potential catastrophe of climate change by the end of this century, but projects a “cost” for preventing that catastrophe from unfolding. This “cost” is calculated as a percentage of annual global GDP. Confusion seems to reign even within the IPCC. A post on the website Real Climate, which is managed by climate scientists themselves, frames it this way: “The IPCC represents the costs (of climate change mitigation) as consumption losses as compared to a hypothetical ‘business-as-usual’ case.” But the IPCC report itself contains a summary chart showing global “Annual Investment Flows 2010-2029” increasing (according to my math, adding up the median projected global numbers) by a potential net gain of approximately $510 billion per year. So how can the “investment flow” increase by $510 billion annually while the world GDP decreases (consumption losses) by 4% between now and 2030? But the confusion runs even deeper. Even if we accept the fact that the world will have to spend an additional $510 billion annually (instead of being forced to spend $510 billion less), we are led by semantic and political logic to believe we will be “losing” $510 billion every year as a global society. After all, that’s what “cost” means, right?—something you lose, something you no longer have because you’ve paid it out. So our minds resist. We don’t want to have to incur that $510 billion “cost”. We’d rather save the money and take our chances that maybe all these IPCC predictions will prove to be wrong, or that our kids, when they grow up, will figure out a great way to make everything okay again. The forces aligned against mitigation exploit this confusion at every opportunity. A 4% reduction in global GDP by 2030 proves that climate mitigation “destroys jobs”—a favorite refrain. $510 billion that we have to spend on goods and services for climate mitigation means that much less is available to spend on the goods and services we’re buying today—money “lost” to a cause we’re not 100% sure is even necessary. The more we can convince ourselves we’re “not sure”, the more iffy it becomes to incur that “cost”—hence the strident effort to counter every new climate report with the opinion of some scientist somewhere that seems to refute the scientific evidence. Then there is this confusion, as expressed by Robert J. Samuelson recently in the Washington Post: “Carbon capture and storage—pumping carbon dioxide emissions from power plants underground—has been discussed for years. So far, it’s not commercially viable.” (Emphasis mine.) So we implicitly assume—as Mr. Samuelson demonstrates—that the infrastructure and carbon-neutral energy systems we’re going to need have to be “commercially viable.” In other words, their development must be market-driven. If the “market” isn’t willing to pay for it, there can’t be any justification for creating it. No doubt the IPCC’s “Changes in Annual Investment Flows” includes a substantial number of electric vehicles and the nation-wide network of public charging stations that will make them convenient and desirable. Until those items become “commercially viable”, however, there’s no reason to expect them to be built because no business is willing to incur the “costs” without the promise of a substantial reward. While Tesla and others have started the inevitable transition, the IPCC report makes clear there isn’t time for the long evolution that radical technology change typically requires. So, we are pretty much left with only the option of prayer—which has the virtue of not “costing” a cent. If we came to our senses, however, and removed our soot coated “cost goggles”, we’d see the most obvious and simple thing: The $510 billion the IPCC suggests must be spent annually to invent and build carbon-zero infrastructure and energy systems—that money gets paid to somebody in exchange for the doing and the inventing and the building. Who would that be that it gets paid to? Well, it might be you if you got busy and positioned yourself as someone who could usefully contribute in some way to the effort. To say that the “cost” of climate mitigation is .06% of global GDP annually is no different than saying the “cost” of pizza is .06% of global GDP. “Cost”—by the simple logic of accounting—is actually something we, the people, get paid—just like people get paid to make pizza. This, of course, reveals the ACTUAL point of contention amidst all the confusion: Into whose pockets is the .06% of annual GDP for climate mitigation going to be directed? 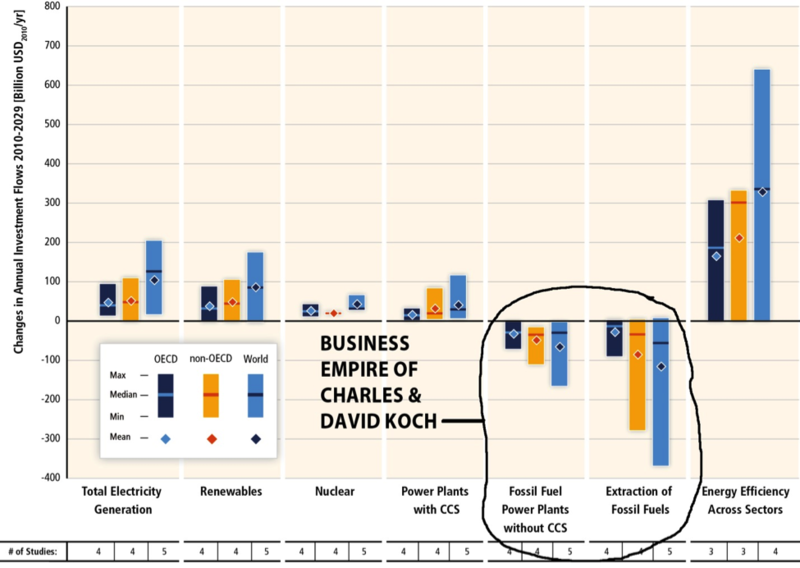 If you look at the IPCC’s chart of “Changes in Annual Investment Flows” it becomes clear what the strident complaining and foot-dragging is really all about—and understandable with regard to where it’s coming from (see below): Those projected negative investment flows happen to be in the cash-generating business empire owned by Charles and David Koch. That simple fact pretty much sums up the whole American political scene about global warming. This entry was posted in J. D. Alt and tagged climate change, MMT, Modern Monetary Theory. Bookmark the permalink. It’s not clear to me what they mean by the cost, either. By the two seemingly conflicting ways in which they have expressed it, I think what they are saying is that .06% of GDP will be diverted from producing stuff we want to buy to producing stuff that business must buy to reduce carbon emissions, and that nominal global GDP will be the same either way: less stuff, but higher unit cost. That makes sense, because there is no reason to think that more carbon or less carbon is going to change the things that drive changes in global GDP: global government spending and tax policy. As for “commercially viable”, what Samuelson means is that for-profit businesses won’t do it unless they are forced to do it. It will raise their costs, which will hurt their sales and profits. It doesn’t mean that we can’t or won’t do it. We do lots of things, and force businesses to do lots of things, that hurt sales and profits. The sort of thing that makes me doubt I understand what’s being discussed. I see the confused language deployed by educated people and think to myself that they can’t be getting this so mixed up, that I must be reading it wrong. And yet after four years of autodidactic study in economics I continue to see professionals make what can only be characterized as basic mistakes, failing to differentiate between a fall in output and a shift in resource utilization. Surreal is the only way to describe it. Actually, we never talk about the costs of pizza as a percent of world GDP. We talk about the share of global GDP attributed to pizza production, and to gold mining, and to automobile manufacturing, etc. This article is an aboslutely perfect example of the broken-window fallacy. Yes, spending money on global warming mitigation will mean that someone else earns that money. It most certainly does not mean that it’s not a cost. The argument presented here could equally be used to justify buying more military jets, building bridges to nowhere, or hiring people to dig holes and then fill them in again. The premise of the Broken Window story is that the shopkeeper would be better off if the window were not broken in the first place. Yes, we would certainly be better off if there were no global warming in the first place. But given that there is global warming, we will pay the cost of it regardless, either in mitigation efforts or in environmental and social destruction. The cost is inescapable. But we have real choices about how and when we pay. Just as the shopkeeper can spend on a new pair of shoes and ignore the broken window if he choses. He choses the window, or the shoes, based on his value system. Whichever he chooses, he is faced with the opportunity cost of not choosing the alternate. Too bad he can’t choose to time travel and prevent the window breaking in the first place. I see nothing in Alt’s piece to indicate he is not fully aware of this or is confused about the cost of mitigating climate change. In fact, a logical conclusion of Bastiat’s story is that the shopkeeper would have been better off had he paid some percentage of the cost of fixing the window on some preventive measure. Thank you for this comment and the link to Bastiat’s essay. Surely you see, however, that the “glazier’s fallacy” goes to the heart of the matter of MMT: the “fallacy” is based on the same assumption about money that generates the belief that sovereign currency-issuing governments must balance their budget just like a household—the assumption being that there is a fixed amount of currency which the sovereign government has to spend. It is true that the shopkeeper, in spending six francs to fix his window will therefore not have his six francs to spend on something else—so, for the shopkeeper (who cannot issue sovereign dollars) the fallacy’s complaint is valid. A sovereign currency-issuing government, however, can spend six francs to fix the window AND six billion francs to mitigate climate change. So long as the real resources—labor, materials and technology—are actually available, a currency-issuing government can create the dollars necessary to put them to use. I use a double entry bookkeeping system where I keep track of cost and keep track of value. Buying something that costs $1, but has a value of $10, is a much better deal than buying something that costs $1, but has a value to 10 cents. You cannot determine if a purchase is a good deal by looking at cost alone. 2) the fact that “[t]he problem of climate change involves a fundamental failure of markets … ,” in the words of Sir Nicholas Stern. Isn’t the First Law of Holes that “[i]f you find yourself in a hole, stop digging”? When it comes to global warming, is it possible The Market is a “hole”? They are definitely thinking about cost the wrong way and trying to get others to do the same, and you do a great job of pointing out the flaws in their reasoning. But what is the right way to think about it? It’s like there are two futures, one where we proactively invest in more efficient production to get the things we want with a smaller environmental footprint. And a second where we continue our inefficient production methods until they suddenly, apocalyptically fail on us. The debate is really over the projected value of these two alternative strategies. The right seems to want to take the second path and they argue in two ways. 1) That the apocalypse will never come because innovation will happen anyway even without explicit public investments. Someone will do the hard work of inventing the new technologies for free and we will all benefit. 2) At other times they are argue that even if we make the effort of investment that those investments will fail and the apocalypse will happen in spite of our best attempts to invest for a better future. Then we will regret have forgone the opportunity to gorge on consumption as much as possible in the period leading up to the collapse. These are both pretty dumb arguments but they seem to be winning the day. Perhaps part of the difficulty in thinking about “costs” of CC mitigation or prevention is the habit of quantifying the costs in nominal terms, in units of currency, or even as a proportion of global output. These are proxies for real output in terms of things made and human effort expended. Climate change mitigation or prevention certainly does “cost” something, since real effort and real things have to be deployed from current uses into the mitigation/prevention efforts (unless there is spare capacity that can be mobilized for these purposes though, even, then there is an irreducible natural resource “cost” that must be redeployed from other uses — steel and concrete, and their embodied carbon, for sea-walls, for example). The $ spent on mitigation/prevention are, of course, paid to someone and so the output redirected into these purposes is not “lost” in an accounting sense, but since it is re-purposed from prior uses, there are distributional costs to some (and benefits to others), which the piece notes. Perhaps what will happen is that the consequences of neglect of the looming problems will be so great that the nations of the world will work together and redirect the ~2% of global output (and the corresponding real resources of people, manufacturing/service infrastructure and their natural resource inputs) that is devoted to military defense into CC mitigation or even de-carbonization of the world economy. That would certainly be a better use of these real resources than what is currently contemplated, that they will be employed in conflict over the future distribution of scarce resources.